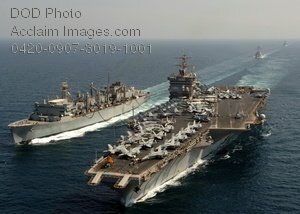 Description: Free, public domain image: Nuclear-Powered Aircraft Carrier, USS Enterprise in the Persian Gulf. 071004-N-5928K-005 Persian Gulf (October 4, 2007) - The nuclear-powered aircraft carrier USS Enterprise (CVN-65), conducts an underway replenishment with the Military Sealift Command (MSC) fast combat support ship USNS Supply (T-AOE 6), while the guided-missile destroyer USS Arleigh Burke (DDG-51), and the guided-missile cruiser USS Vicksburg (CG-69), follow behind. Enterprise and embarked Carrier Air Wing One (CVW-1) are currently underway on a scheduled six-month deployment. U.S. Navy photo by Mass Communication Specialist 3rd Class N.C. Kaylor. LT Mark C. Jones, PAO CVN 65.